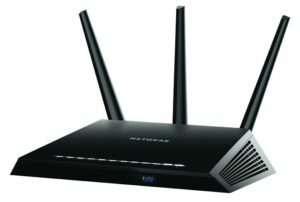 You can update firmware on almost any router using this method, providing of course, that you are not changing firmware versions but rather upgrading from one firmware version to the next. We’ll be using the ASUS RT-N66U for demonstration. The concept is the same for most factory routers. 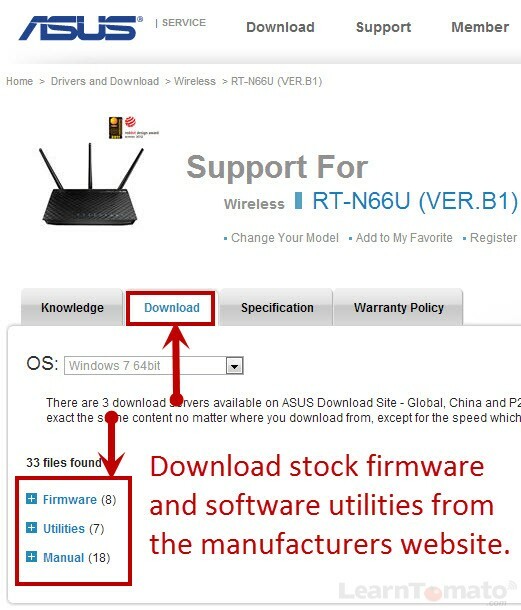 Updating your router with factory firmware is not a “required” step. It is a “precautionary” step before installing 3rd party firmware such as DD-WRT or Tomato. Why? Because sometimes a factory update will update hardware issues such as memory size, which cannot be changed with 3rd party firmware. 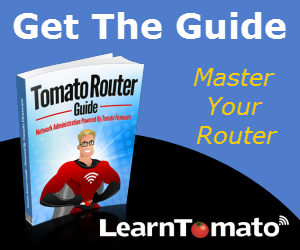 Navigate to the manufacturers website and select the category and model of your router. Download the most recent factory firmware, software utilities, and documentation for your device. Just download the latest version for each item. If you are not sure, check the release date. It should be posted next to the item that you are downloading. Not all manufacturers do this. Some only post the most recent version. Some make all versions available, even since the device was released. Next, make sure you have a wired connection to your router. Connect one end of the cable to your computers Ethernet port. Connect the other end to one of the LAN ports on your router (preferably LAN port #1). Once you’ve downloaded the latest factory firmware, login to the router administration panel and upgrade the firmware using the upload feature. This option is usually located within the “Administration” or “Configuration” section of the admin panel. After you click “upload,” don’t do anything! Just wait patiently. You’ll be logged out of the router and asked to log back in. You’ll see a “continue” button with a countdown timer. Click continue. You won’t see anything in the browser window. If #3 happens, wait a several minutes and then navigate to the IP address of the router (192.168.1.1, or whatever your routers IP address is). You should see the login window. If not, wait another 5 minutes and try again. If still no luck, reboot the router. After rebooting, wait another 5 minutes and run a “ping” command from your computer to see if the router responds. Remember, these are not high-powered computers like your desktop. They are low powered devices with slower processors. It may take a few minutes for the router to adjust. Be patient. TIP #1: In most cases (notice I said “most”), the upgrade will not affect your settings. However, if the manufacturer issues a major change, it could reset some (or all) of your settings. Therefore, its always a good idea to read the update notes from the manufacturer when downloading a newer version. TIP #2: I’ve never seen this happen, but it could happen. That’s why I’m telling you this. If a firmware update does reset your settings and you are unable login, don’t freak out just yet! 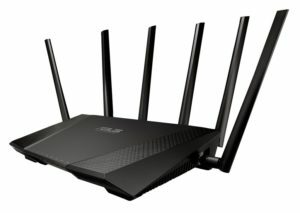 If you previously changed the routers IP address, say 192.168.55.1, the upgrade may have changed it back to the factory default IP (192.168.1.1. etc.). If this is the case, check your computers IP address to ensure that you are in the same subnet (192.168.1.x). If your computer is not in the same subnet, it will be unable to communicate with the router. This would appear like a “bricked” router when in fact, the router is perfectly fine.